"Tell Yoani to Shut Up"
Orlando Luis Pardo and Yoani Sanchez in Havana, 4 days after they were kidnapped and beaten by plain clothes security agents. 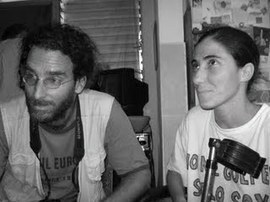 Yoani's shirt says, "Don't hit me, I'm just a blogger"
Note: This prose-poem guest column was written by Orlando Luis Pardo who was kidnapped and beaten together with me on the evening of November 6. A belt of red spots from too much force by a teenage officer and a case of my bad coagulation. Look at my neck in the jpg. According to how you interpret it, it is insulting or interesting to tell. In the beginning there was no Verbum, only Barbariem. Non-verbal violence pulse. After today, walking in the Vedado neighbohood will be an extreme experience. The Avenue of the Presidents will refer, now, to a post-princely prison. Within seconds, Yoani and I had our arms twisted in a car imported from our Stepmother Country: China My head against the car's carpet, and Yoani with her feet in the air. I couldn't see her, identifying her only because she would not be quiet. In seconds, I heard her scream with the vehemence of a being who is the freest person on the planet. She had a Cuban man's knee nailed against her chest, and still she rebuked him. From that energy I borrowed the strength to revive a bit my own voice. They told me to tell Yoani to be quiet. That phrase, pronounced by three unknowns in the name of the Cuban State, sums up the obsolescence and obscenity of this country. "Tell Yoani to shut up." Despotically, they deposited us in a corner that I confused with the patio of a barracks. I felt disgusted, I wanted to vomit. I could not move my neck. I embraced Yoani (which I'd never done before). She began to sob. The greatest woman in Cuba seemed like a tiny girl of zero years. Because Yoani is that: the future of Cuba crystallized in a fragile and irrepressible body. I kissed her head. Her hair, pulled with such hate, smelled like freedom. Once. Twice. Ten. Uncountable times I kissed her ageless head. But I never told her to shut up. Orlando's neck Friday evening just after the kidnapping. Orlando Luis Pardo's blog, Boring Home Utopics, won the prize for the Best Photography Blog in the recent Virtual Island blog contest.